Ignoring 500,000 abbreviations, the names of 84 million chemical substances and roughly a million insect species, it is estimated that the English language has between 300,000 and 600,000 words. There's a lot of dispute about these numbers, which isn't surprising, since it concerns language, whose guardians often are worryingly meticulous and almost invariably strung-out on quarrelling. Although there are diverging opinions concerning Bacon and Shakespeare being one and the same person, I'm inclined to believe such is the case. Particularly since the person in the other option was barely capable of writing his own name, left no writings typified by accuracy and eloquence commonly found among legal practitioners and had no knowledge of royal court etiquette that played quite an important role in several plays attributed to Shakespeare. Bacon left the British people some 2000 books, which of course weren't all written by himself, since no man can write that fast, unless perhaps he would have reached a triple digit age. He hired scribes that translated the Greek and Roman classical works into English, because he wanted to give the Brits literature. He envisioned Britain to become a great nation and was aware of the fact that no nation can rise without a proper language and magnificent literature (besides having lots of canons and guns). 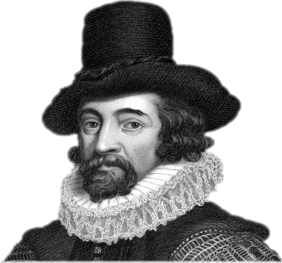 Beside the practical and beautiful linguistic aspects Bacon also wanted to embed ancient secret knowledge into the language he was building. Being well versed in occultism and esoteric philosophy allowed him to do that with the assistance of the very skilled, internationally oriented group of writers and poets he had gathered. This is why the English language contains a number of words that have an extremely complex and profound meaning, that isn't obvious except to those who have uncommon, occult knowledge. Other languages often need one or more sentences to translate a single English word to even come close to what properly educated Brits understand it to mean. For one man to establish such a tremendous achievement almost is beyond imagination. But Bacon accomplished it and possessed an ego strong enough to not overtly demand credit for this rattling feat. It's also possible that he imagined that the language he initiated to construct, would play a role in bringing about events hardly anyone else could foresee. This is because language can be used to communicate the truth as well as the opposite. English is capable of serving both purposes excellently. In view of the nature and complexity of Bacon's project, it makes sense to assume he didn't leave a lot to chance. With reference to what I wrote in the next blog entry, language should therefore be used with care, until there's no more need for it. This may sound strange, but advanced AI systems have been known to create their own language that has a richer, more accurate and infinitely faster power of expression, not in a literary sense, but to exclude misinterpretation and indicate feats belonging to a level of intelligence that is higher than common human wit. Humans in telepathic communication, by the way, could also have no need to use language.... Some people claim to be able to wordlessly communicate on a basic level with their pets. That could become some sort of universal means of communication that probably has the potential to radically end the linguistic confusion that allegedly took place in Babylon (which in itself also is an interesting topic).